A Year of Being Here: Stephen Mitchell: "The Baal Shem Tov"
looking on in mute compassion. that it can appear as gift. You wanted to get down on all fours. on tiptoe, flapping your wings. 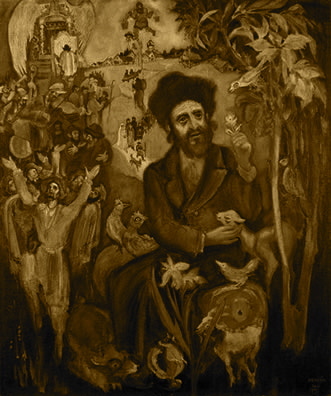 "The Baal Shem Tov" by Stephen Mitchell, from Parables and Portraits. © HarperCollins Publishers, 2009. Image credit: "The Baal Shem-Tov," painting by Saul Raskin (originally color).